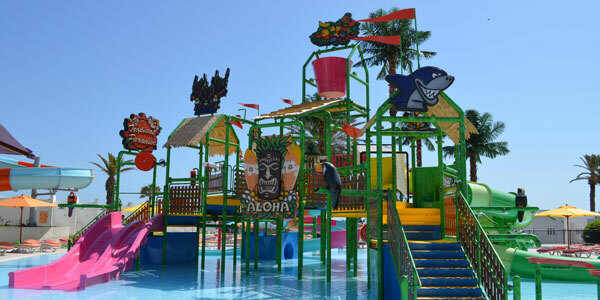 The water kingdom got now its name : it's called Thalassa Sousse Aquapark... It has opened at the end of May 2013 and its opening is considered in Sousse as one of the most important events since several years... 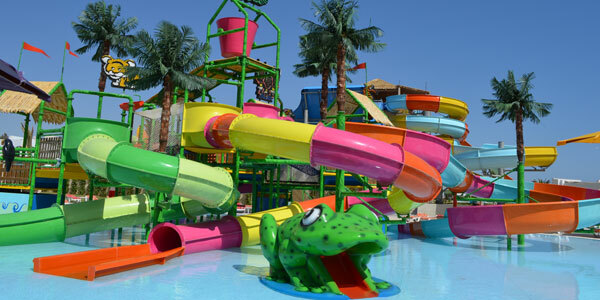 It is the largest aqualand in Tunisia ! The concept is unique in Tunisia ! The Thalassa Sousse Aquapark is already very much appreciated by Tunisians and Tourists staying at the Thalassa Sousse Hotel. 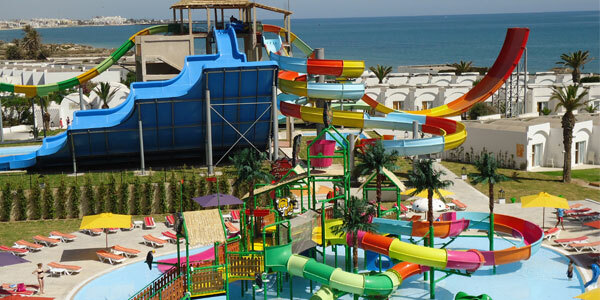 The Aquapark is located in the magnificent park of the hotel (Thalassa Sousse belongs to the Thalassa Hotels Group) and is renowned to be a "propeller of sensations and unique emotions" thanks to its colorful and funny slides in which you slide down at high speed ! The children have their own space, the Kid's Play and Fun, a very joyful world that has been especially designed for them... They love it ! The adults have the choice between Blackhole (height 10m and length 100m), Up Hill Flying Boats (height 10m et length 55m), Wave Slide (height 10m et area 500 x 3000), Twisters (height 9m20 et length 53m), Tunnel Freewall (height 12m and length 53m), le Kamikaze (height 12m and length 47m), Tsunami height de 11m, le Freefall (height 12m and length 47m), Up-Hill Blackhole (height 12m and length 11.45m), Rafting Slide (height 10m and length 100m), Turbolance (height 11m and length 55m) and Space Hole height 12m50 and length 72m with bowl ! 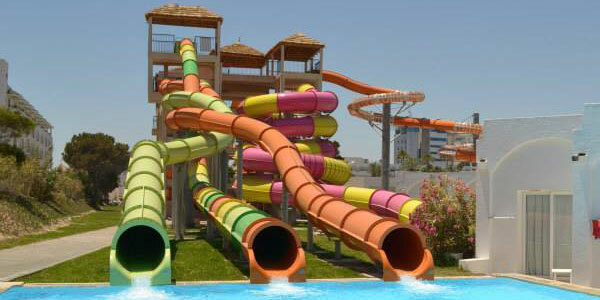 The Thalassa Sousse Aquapark is full of funs and thrills... but is also relaxing all year round... So, besides the omnipresent Tunisian sun, the magnificent beach, the transparent waters, the day and night hotel entertainment, please add to your holiday's agenda the sensations and the pleasures of our colorful slides... The Aquapark is open every day from 10am till 5pm. Height 97.56 meters, Length 10 meters. Length 54.66 meters, Height 10 meters. 500 X 3000, Height 10 meters. Length 53.06 meters, Height 9.20 meters. Length 53.95 meters, Height 12.00 meters. Length 52.91 meters, Height 9.20 meters. Length 46.94 meters, Height 12.00 meters. Length 46.89 meters, Height 12.00 meters. Lenght 80 meters, Height 11.45 meters. Lenght 99.78 meters, Height 10.00 meters. Lenght 55 meters, Height 11 meters. Lenght 72.30 meters + BOWL, Hauteur 12.50 meters.